It is of interest to note that the Neo-Ottoman policy is firmly rooted in a pyramid-like social stratum structure, as envisaged by Ankara which has a large base of mostly Muslim illegal immigrants in the Balkan countries, a medium stratum composed by the local Muslim minorities, often of Turkish descent and an upper crust of newly converted Muslims, coming from the indigenous Christian populations, in a reminiscent of the “Janissary”. In order for this long-term aim to be achieved, cultural and religious tactics are being promoted, financed and implemented in the Balkans, that aim to portray first and foremost the era of the Ottoman Empire as a “Golden era”, where various sophisticated forms of art and literature where achieved, under the protection and guidance of the Istanbul Sultan. In essence a typical “public diplomacy” mechanism is being implemented, which is firmly based on history and coupled with a heavy flow of financial donations and support to “willing” organizations and individuals across the region. Ali Gurata proceeded into singing a relevant agreement with Mehmet Salman the director of restoration of the national center of Skopje. Guarata, stated that ” The Mosque of Bitola is the second in a series of restorations, following the one of Sarajevo…in the Balkans cultural values that date back from the Ottoman era should be protected…our agency protects not only Islamic monuments but also Christian and Jewish”. 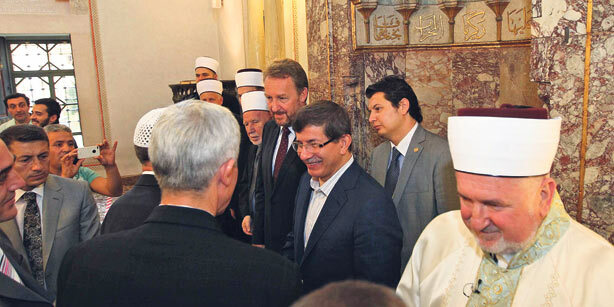 Furthermore in mid-2012 the Mosque of Konya in Turkey financed another two Ottoman-era monuments in the city of Tetovo. The Mayor of the city Bexheti stated that there will be a restoration for a watch-tower, and a stone bridge in the Rena River. Both of these sites date back in the 16th Century. Another interesting note in the subject is the donation announcement in November 2012 by the Turkish government for the creation of a museum in Skopje in commemoration of Kemal Ataturk. The assistance for that purpose amounts to 300,000 USD and the representative of the Turkish organization TIKA, stated that “I would like to thank the government of Skopje for its also generous support towards securing our nations common cultural legacy”, clearly implying that the local government also financed by its own means this project. The main purpose of this museum would be to attract Turkish tourists in Skopje and already since 1994 another smaller-scale project of similar nature was undertaken by the Turkish government regarding Kemal Ataturk in that city. At that point it is interesting to note that the leader of the local Islamic community of Skopje, Suleiman Rexhepi, stated in late 2012 in the newspaper Journal that the Albanian Muslims should work towards the goal of “Greater Albania”. Those statements come almost in parallel with similar series of statements from Albanian leaders and most notably Salim Berisha the Prime Minister of the country. At the same time the people aforementioned, along with a large number of Albanian public figures in FYROM, seem to enjoy cordial relations with the Turkish diplomacy, thus raising serious questions, as to whether local political life has been controlled to a great extent by Ankara, that would have the capabilities to “Make or break” the country, thus influencing both its domestic political life and also its foreign relations. The Neo-Ottoman influence, coupled with the also all-intruding presence of Salafi Islamists in the Balkans, has also resulted in direct involvement of local Muslims with the Syrian civil war. According to an Albanian newspaper in Kosovo in early December 2012, religious extremists from Skopje, Kosovo and Albania, are taking part in the armed clashes against the Syrian states. They take videos of their involvement in Syria and sent it back to their homelands. Small military groups of these young Albanian men have been composed named “XHEBHETUL NUSRE” and “Të huajve të Shamit” – PRISHTINA”. Up to date there was an official one casualty of Naman Demolli, resident of Pristina born in 1974. 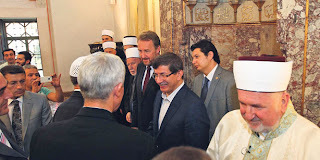 It is not by coincidence that this particular person was one of the organizers in the 2011 demonstration in the University of Pristina that called for the creation of a large Mosque in the city and in particular in the premise of the University campus, a move that was supported by the Turkish diplomacy at that time. In similar fashion, all available and credible information point out that the Albanian Islamic groups venturing into Syria have all passed and stayed temporarily in Istanbul before venturing in the Turkish-Syrian borders and consequently in the battle zones that are raging in the latter. A tacit approval by the Turkish security and police forces would be needed for that venture, although that violates clearly all international and local Laws surrounding the activities of either mercenaries or volunteers taking part in armed conflicts in another sovereign state in which there is no declaration of war. Lastly, the continuous involvement of Turkish public diplomacy in the Balkans has as a consequence the interaction of Middle Eastern politics with those of the Balkans, leading potentially to situations that will have a destabilizing nature for all actors involved.